3D Graphene – Signet International Holdings, Inc.
A new deicing application for aircraft will be enhanced by graphene, the revolutionary carbon-based nanotechnology. The 3D graphene foam−polymer composite can deice aircraft with superior deicing efficiency. The patent on the new material takes effect next week. Signet subsidiary, Signet Graphene Technologies, Inc., has signed an agreement with Florida International University’s Department of Mechanical and Materials Engineering, where the new deicing material was created, to develop and market the new product. The material is a highly conductive multifunctional 3D graphene foam−PDMS polymer composite, or 3D GrF for short, with high-efficiency current-induced deicing capabilities. 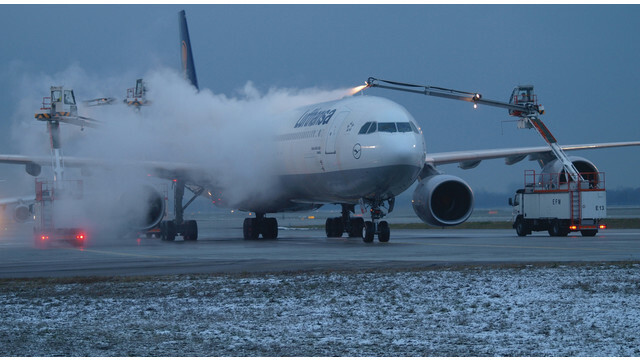 3D GrF is a significant technological innovation in aviation deicing. The 3D graphene-polymer composite provides electrical current-induced heating and deicing capabilities for aircraft, and has demonstrated impressive thermal stability to 100 electrical loading−unloading cycles. Its application is intended to serve both the public and private sectors. Graphene’s high electrical and thermal conductivity, in combination with its extremely low density, provides an intrinsic uniform electrical and thermal transport path resulting in a lightweight composite with enhanced multifunctional (electrical, thermal, and mechanical) properties to serve as active deicing components on aircraft structures. Applications of 3D GrF serve as lightweight coatings and free-standing components with heating abilities in structures operating at extremely low temperatures. The coating also increases the tensile strength of the aircraft. 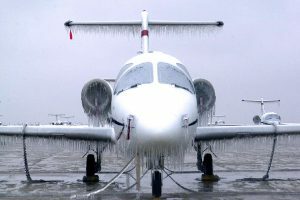 Current efforts to reduce and mitigate the ice formation in aircraft surfaces include the dispersion of chemicals, mechanical removal, and electrical heating of surfaces have inherent limitations. Besides the excessive costs and time of deicing each aircraft individually, toxic chemicals pose environmentally hazardous runoff. 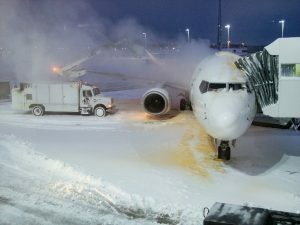 The chemical runoff is so hazardous, efforts to contain, cleanup and even recycle the toxic ‘spills’ after each deicing has become necessary, which adds to the excessive costs. As for electrical heating systems, though they have proven suitable for deicing, when implemented, the current-induced heating system results in high power consumption, and therefore, higher costs. As a student at FIU, Jenniffer Bustillos noticed something that frustrates many fliers: the flight delays caused as the result of planes needing to be sprayed with deicing fluid to be safe for travel. She, along with Arvind Agarwal, PhD, Chair-FIU’s Plasma Forming Laboratory, Department of Mechanical and Materials Engineering, and Professors Cheng Zhang and Benjamin Boesl, successfully fabricated a graphene foam−polymer composite with superior deicing efficiency and strength, and has since filed a patent along with FIU on a de-icing system. Using graphene foam, the new method is more efficient, making travel safer and a little better for the environment. Signet has now partnered with FIU to develop and market this extraordinary material.